If animals are living symbols of the cosmic design, snake, with it’s exclamation point body is the very image of a symbol. She is a gliding hieroglyph speaking volumes to the psyche about our most primal abilities to heal and renew.Her energy is the cosmic declaration of, ‘Yes, I will survive!’ and it is for this reason she is the symbol presiding over all the healing arts. Where all animal spirit medicines speak of healing, the Snake totem is the medicine of medicine itself. Her lessons are a private journey into releasing the personal and opening to the universal. Life, to be lived, requires a body to do so. This is so obvious a statement that the full value of its significance is often overlooked. Earth has been trying on shapes for size for roughly 3.4 billion years, beginning with simple cells in primordial waters. Snake emerged from those waters as a single mass of muscle roiling itself forward with an unnerving conviction. This muscular propulsion reminds us that we are not the forms of life, we are the life within those forms shining through. We are the movement, the undulating conviction that drives our bodies forward into all the experiences under the sun. 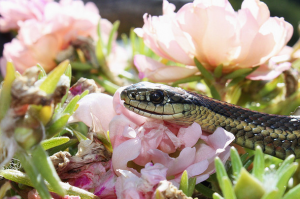 Snake medicine speaks of transcending personal pain, gaining a sense of security in the midsts of instability, and learning how to renew without having to replace. The teachings of this animal urge us to not give up on or throw out that which may still be quite useful. When snake medicine glides into your life, it is time to schluff off the old pattern so that the new design can pulse with the most current energy. It is time to listen to your body’s discomfort and locate the real source of the pain. Snake, unlike dragonfly or butterfly, does not transform herself into a completely new shape. She molts; a process of gliding through old dead cells to emerge improved and renewed with its original design intact. This molting process, when applied to healing, can range from mildly irritating to debilitating contractions of violent pain depending on the lessons being presented. What do we do with pain? How can we end it? Snake says, don’t run from it. Turn around and move into it. Snake unlocks her jaws and swallows life whole. Confronting pain is the only way to completely dissolve it. Snake teaches us that the basic function of pain is to teach us of the true reality of life outside delusional social conventions. That reality is a silent experience beyond words. It is in this silence that healing occurs. Surviving the trials of snakes’ poisoned bite transmutes the soul beyond our body, reminding us that we are not just skin and bone. We are that which quickens the skin and bone. We are conviction itself and that energy is eternal. Conviction is a cosmic force that moves planets and burns stars. Snake can not survive without direct daily contact with the sun. Her inability to generate her own body heat makes her dependent on her external environment. But this seemingly external dependence is ultimately an internal process indicating that both the internal and external are one. They are not the same, but they are one together and inextricable. Likewise, to live well we too must make sure our outside environment is providing the fuel we need to generate our own conviction. Snake medicine finds the balance between what we can accomplish alone and what we need help with from the outside world. This balance between the inner and outer relationship with life also teaches us about our relationship to the art of receiving assistance particularly in regards to the medical arts. The act of healing comes from within our own body, so that the most vital requirement for all healing is a willingness to heal. But ‘willingness’ is not a mental high jump we can just fling ourselves over into. We can not will ourselves to be willing. We can not order our minds to be receptive to healing. The old philosophy of ‘mind over matter’ is misguided. Eventually that matter will mind back in the form of back pain, headaches, knee pain, etc. To address an ailment, we must start from where we are, tensions, limitations and all. If our thoughts are fraught with doubts, unreasonable expectations, anger, or fear, the first order of business in the healing process is to address our mental state of mind and guide it towards greater receptivity. Assistance with this mental journey is certainly available with friends, therapists and care givers, but snake reminds us that ultimately the journey is a singular one which only you can motivate from within. Your ability to locate your own inner conviction to heal will propel you forward into life. But that healing process may involve dying to the old physical structure. During the molting process a snakes eyes glaze over, indicating that she is dwelling between life and death. Her body dies as her life energy reemerges. The life within your body is an eternal continuum of energy. Snake knows that death of the body is only a molting of spirit into the next expression of life. The connection you make with that spirit within you is something you take with you at the time of death. It is the one and only thing you take with you into the beyond. When money, status, house, career, and family must all be left behind, consciousness is never lost. Seeking greater conscious awareness is the most sensible investment of time you could make in your life and it is the most important thing you need to do every day before all other goals. The snake totem has been used as the symbol of medicine for thousands of years all over the world. In America the health care system itself is in a molting process of renewal. Since health insurance companies have driven medical costs so high as to make services unattainable for many hard-working, deserving people, it is vital that a person in need of medical assistance find effective resources without going into debt. It is of no small irony that the ancient symbol of healing arts, the Rod of Asclepius was, in America, replaced by the caduceus, an ancient symbol for commerce. Whether this was deliberate or unconscious, the symbol of commerce has most certainly dominated the medical arts in this country, crowding the field with profit-making business-minded people rather that with true healers. This commercial symbol has created an illusion that health can be bought and sold. But this illusion will eventually molt into a new system. Until it does the true healers of this Earth may be a bit harder to find, but they are here and you can find them if you keep looking. When you meet a doctor for the first time, if you do not sense a deep passion in them for their work do not return. If the doctor seems rushed, distracted, or remote do not return. If the doctor takes time to listen to you, if you feel safe and peaceful in their presence, you have found a healer. Diagnosing ailments is all ultimately a big guessing game as all of life is a great mystery. But doctors and healers have committed years of their life to learning the patterns of imbalance to make the most educated guesses possible. This life long study makes them an authority in advising and guiding. But ultimately it will be you who discovers and applies the cure. No one but you can heal your being and that process starts with a leap of trust and allowing an authority to assist you to the best of their ability. Snake medicine first urges you to find ways to avoid the medical system all together by seeking a solid education in preventative medicine and live a lifestyle that does not court illness. Don’t wait for symptoms to occur to change bad habits. Prevent ill health with healthy foods and exercise. Going for a walk every day is profound preventative medicine. Snake teaches that not everything has to be difficult or complex to be credible. Simple solutions are often overlooked in exchange for the complex and unnecessary. Where there are many extraordinary discoveries in the pharmaceutical world that have helped us battle a variety of topical discomforts ranging from skin afflictions to respiratory problems, the best doctors will only suggest complex pills or chemical prescriptions as a very last resort and will urge you to seek education about the nature of your discomfort before numbing the pain. Your body is a healing body by it’s very nature. The ability to heal is inherent in your design. Snake knows that behind every physical pain there is a spiritual conflict seeking resolution. This spiritual conflict is able to be transmuted emotionally if you are willing to let life get a little weird. One glance at snakes chilling gaze is enough to confirm that life is ‘most wondrously strange’ and to heal we may just have to drop our social conventions and join that strangeness, transmuting our old cell patterns to emerge renewed. But we can’t possibly prevent everything. When ailments do come it is wise to have already found a trusted health advisor so that you do not function from a place of panic when help is needed. Find a healer before you need one and develop an authentic relationship with them. But Snake medicine knows that no doctor can heal you. Many doctors present themselves as an authority over your own inner knowing. And many patients go to a doctor to just be told what to do without realizing that they themselves will ultimately be the ones doing the healing work. Snake absorbs the heat of the sun but once that energy has been received, it is up to the snake to use the energy well. In truth, both doctor and patient heal the pain together. The process of healing the body is collaborative in nature. You and your doctor are both investigators; one of you is a removed and objective external source of energy while the other is experiencing the confusing mystery first hand. How to have that conversation can not be found in an instruction manual or text book. It is a spontaneous improvisation of discovery that will most likely make you uncomfortable in a variety of ways. Physical pain in the body is the very last manifestation of imbalance. The ultimate source of imbalance is located in the metaphysical part of us either in the form of memories, emotions, misunderstandings, and unconscious thought patterns. Snake knows that moods and thoughts are inseparable from the physical body. If the metaphysical cause is addressed, the physical body can molt and renew with astounding alacrity. All pain, physical or mental, is telling you something about how you understand your life. The pain is asking you to stop and listen to that which you have been avoiding. The body is not compartmental and physical pain must be treated in harmony with emotional pain so that both imbalances can rise up together and be released. But the power of snake is not a daily, long-term medicine as the experience of pain is not something that lasts. Life can not sustain constant trauma indefinitely. That migraine, that ulcer, that broken heart will eventually end and the pain of it will be forgotten. Snake asks you to remember trauma and pain to the fullest possible pitch so that you can then truly forget it and let it go. The willingness to remember and then to forget is the final stage of healing. Forgetting is not abandoning the past, it is accepting the reality that all things, no matter how significant, will eventually fade in meaning. All things in time come to an end. Behind time is eternity, the true nature of life. The evolution of the human mind began with the reptilian brain and slowly developed the complex cerebral cortex. The majesty of the third brain has enabled humans to become conscious of life’s evolution. We are not only participating in evolution on a physical level, we are aware that we are doing so. Conscious evolution has the potential to change the nature of existence as we know it, turning the human ‘condition’ into an act of beauty rather than a struggle. The power to transmute pain is the power to locate and maintain an exquisite tension of joy. It may seem strange to find joy in so daunting a creature as the biting, poisonous snake. But the explanation to that puzzle is only found on the other side of the experience she offers. Snake says take courage and take the journey, you not only won’t regret it, you will lose the ability to ever regret again. It is no coincidence that Snake was the symbol of corruption in the garden of Eden. In its most concentrated, snake medicine is a shamanic passage, which, if survived, will bring deeper consciousness. Do you have comments or stories involving Snake Medicine? I’d love to hear from you!